Do you remember this quilt? Some friends of ours just became foster parents to a beautiful little girl. I wanted to make a quilt quickly to honor this special time in their lives. While I was searching for patterns and fabric I came across 17 blocks that I didn't need for the first quilt. 16 of them made a perfect baby quilt size - 36" square. The pattern is "Easy Bake" by Cluck Cluck Sew. 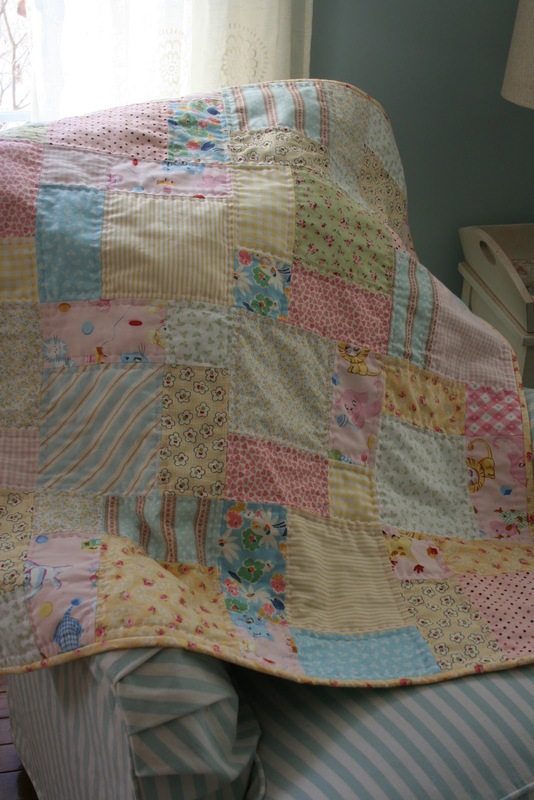 It's hand quilted with size 8 pink perle cotton. For the backing I used a pretty retro kitty fabric that I had in my stash. Isn't it sweet? I encourage you to keep leftover blocks. You never know when you will need something in a jiffy. Three large blocks can be a table runner and one large block and be made into a pillow. Your time is cut in half and you have a homemade gift in hardly any time. Sew fun! Adorable. What a great gift it turned into. 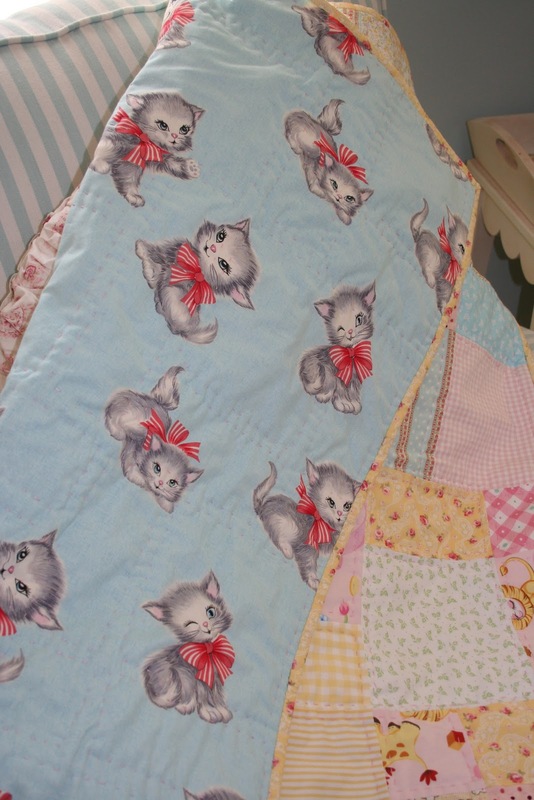 I love the fabrics and the retro kittie fabric. Hi Renee!I so love the kitty fabric to sweet. So pretty! Love the soft colors and the kitty fabric! That is the sweetest quilt, Renee. The kitty backing is perfect. Good ideas for leftover blocks too. I see you are sticking to your resolve to use what you have. How precious. A gift that will shelter not only the baby but the parents, too. Truly "sewn with grace." Renee, it is so sweet and I DO love the retro kitty fabric. It is the perfect addition to your blocks. What a beautiful quilt Renee!! 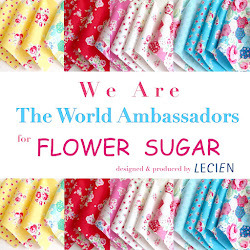 The fabrics are so cute!! I keep everything - even applique pieces I end up not using! What a sweet little quilt. I love the backing! Perfect! awwwwwwwwwwwwwwww Such cute backing fabric!! That little girl is going to be very happy with her quilt! I WANT that baby quilt! I love the pattern and the colors. I must talk my sissy into making me a quilt someday. It is a darling quilt Renee....as all yours are. Now that's making use of what's on hand. Nice job!